For Jacob’s Shirt Quilt, I used fabric scraps from making cotton shirts for my son during the past several years. His favorite shirts are made with 100% cotton novelty, batik and unusual print fabrics. This top was machine pieced on an early 1950’s Nelco sewing machine acquired through Freecycle. It sewed beautifully! I backed the quilt with a pale blue king size sheet which had to be enlarged using a matching twin size sheet. The mottled red border is from my stash, the navy blue border is cut from a twin size sheet and the outside border is scraps from making the quilt. It is bound with navy blue. The batting is Hobb’s Poly Down. It is incredibly easy to hand quilt and I love the low loft and light weight of the finished quilt. 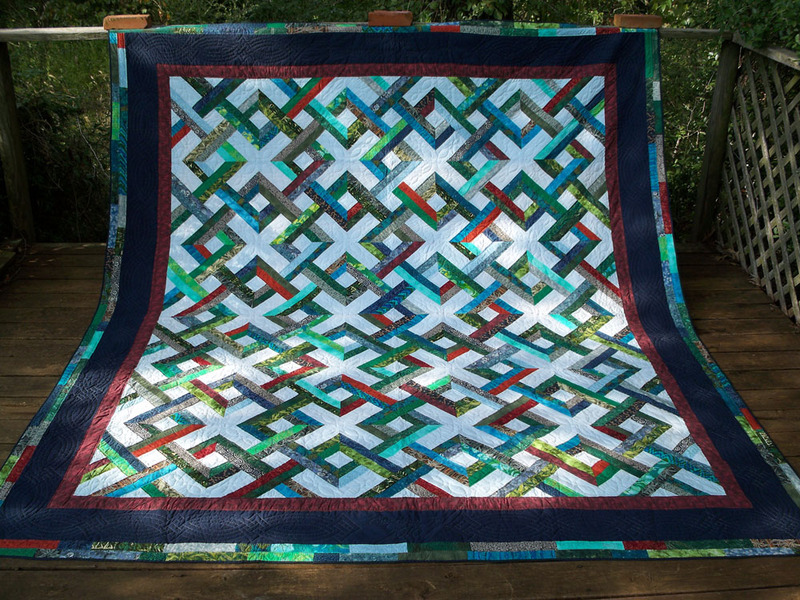 The hand quilting is an original design and the border quilting was inspired by a Celtic coloring book. I used Gütermann pale blue thread. 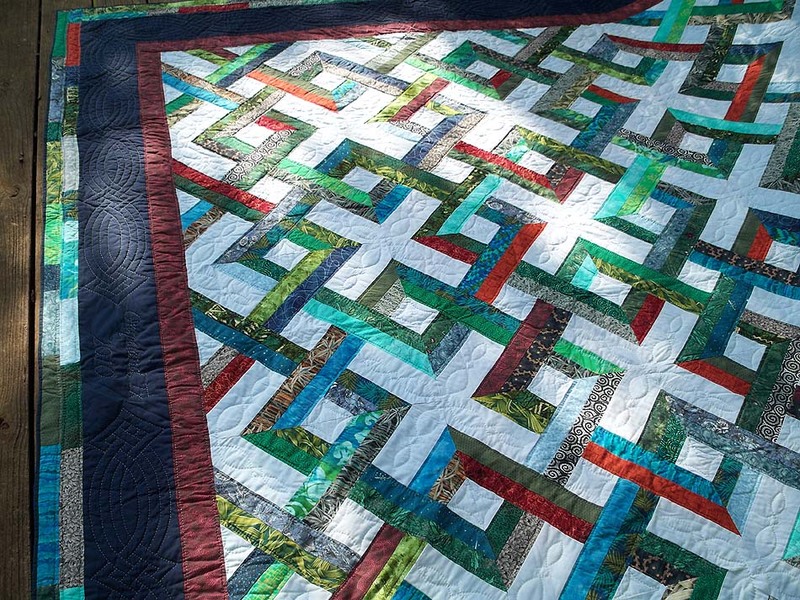 The quilt is 6″ longer and wider than a king-sized sheet. Jake has his great grandfather’s tall, antique iron double bed so this quilt reaches nearly to the floor all around. I’ll now give credit where credit is due. This pattern is called “Sunset” and is a Sunflower Hill Design by Julie Popa. Hi Kathy, I don’t make quilts to sell. 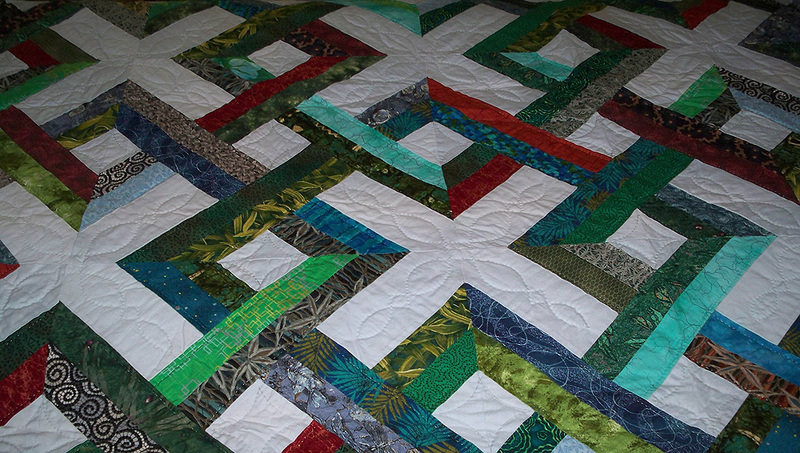 If you truly want a quilt, I suggest you make one for yourself. It’s easy and gives you something to do with your hands as you watch TV. There are tons of instructions all over the Net. Go for it!